CNMI Marriage Encounter: Celebrate World Marriage Day on Feb 7th! 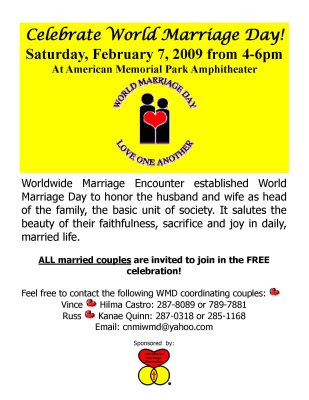 CNMI's World Marriage Day celebration will fall on Saturday, February 7th 2009 at the American Memorial Park amphitheatre. All married couples are invited to attend and we are also searching for the Longest Married Couple in the CNMI! The special couple will be honored at the celebration!